Florence weakened to a tropical depression as it marched inland, unloading a powerful mix of wind and rain on the Carolinas after killing at least 13 people. Despite its weakening Sunday from a tropical storm, its relentless rain drenched already saturated areas as authorities warned the danger is far from over. "The flood danger from this storm is more immediate today than when it ... made landfall 24 hours ago," North Carolina Gov. Roy Cooper said Saturday. "We face walls of water at our coasts, along our rivers, across our farmland, in our cities and in our towns." • Florence's location: By early Sunday, Florence's center was 20 miles southwest of Columbia, South Carolina, with maximum sustained winds of 35 mph. It was moving west at 8 mph, the National Weather Service said. Losing strength: Florence weakened to a depression, but flash flooding and major river flooding will continue over the Carolinas. • Looting arrests: Wilmington police said they arrested five people who allegedly looted a Dollar General store. Another person was arrested for allegedly looting an Exxon gas station and convenience store. 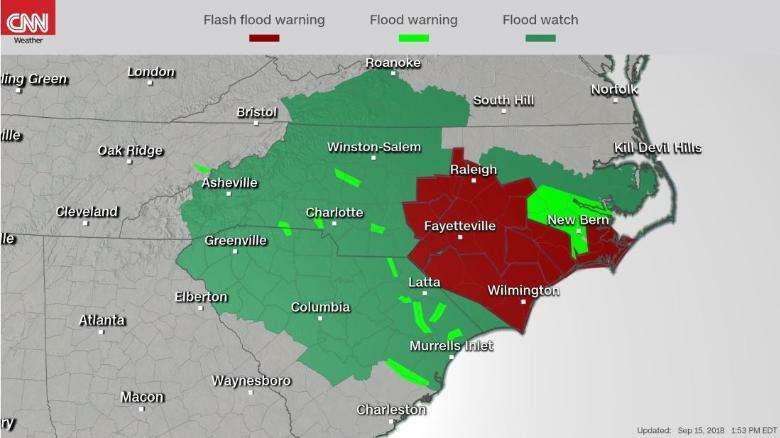 • Much flooding to come: By storm's end, up to 40 inches of rain will have fallen in parts of North Carolina and far northeastern South Carolina, the National Hurricane Center said. Some other parts of South Carolina could see rainfall totals of up to 15 inches, forecasters said. 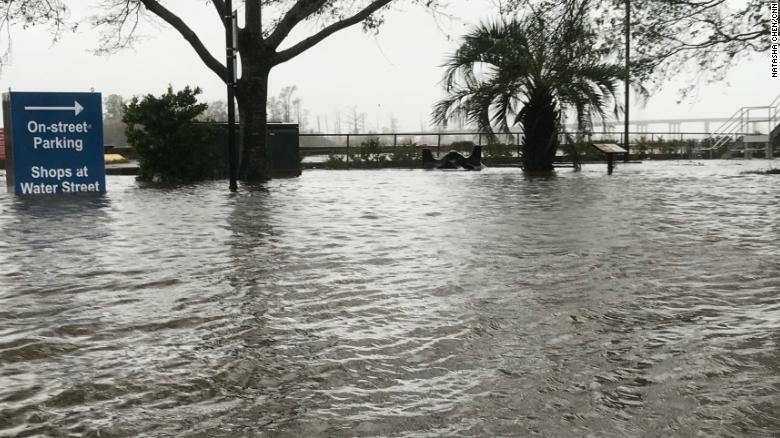 • Record rainfall: Florence has dumped more than 30 inches of rain in Swansboro, North Carolina, breaking the record for rainfall from a tropical system in the state. The previous record of 24.06 inches was set during Hurricane Floyd in 1999. Members of a Federal Emergency Management Agency team from California search a flooded neighborhood in Fairfield Harbour, North Carolina, on September 14. Rescue workers attempt to remove a giant tree that fell onto a house in Wilmington, North Carolina, on September 14. Two people died when the tree collapsed -- among the first storm-related deaths due to Hurricane Florence. Electric poles that snapped in half sway from their wires in Wilmington on September 14. Lee Casteen, left, and Try Hinton use a chainsaw to clear a tree blocking a road in Wilmington on September 14. Rescue workers help a woman and her dog from a flooded house in James City on September 14. Michael Nelson floats in a boat fashioned from a metal tub and fishing floats after the Neuse River flooded September 13 in New Bern. Powerful winds and waves destroy portions of a boat dock and boardwalk in Atlantic Beach on September 13. Residents wade through streets flooded by the Neuse River in New Bern on September 13. Astronaut Alexander Gerst posted this photo on Twitter of Hurricane Florence saying, "It's chilling, even from space." Gerst is aboard the International Space Station. Evacuees take refuge at Burgaw Middle School in Burgaw, North Carolina, on September 12. Marge Brown says goodbye to her father, George Brown, before his evacuation from a health care home in Morehead City, North Carolina, on September 12. Workers take boats out of the water in Wanchese Harbor in Wanchese, North Carolina, on September 12 as the Outer Banks prepares for Florence. Astronaut Gerst also posted this photo to Twitter on September 12, saying, "Watch out, America! #HurricaneFlorence is so enormous, we could only capture her with a super wide-angle lens from the @Space_Station, 400 km directly above the eye. Get prepared on the East Coast, this is a no-kidding nightmare coming for you." Jeff Bryant, left, and James Evans board the windows of a business in Myrtle Beach, South Carolina, on Tuesday, September 11. People fill sandbags in Wrightsville Beach, North Carolina, on September 11. Both lanes of Interstate 26 flow westbound in North Charleston, South Carolina, toward Columbia as people evacuate inland on September 11. Laura Gretch holds Frances, a Chihuahua mix, as she helps unload cats and dogs arriving at the Humane Rescue Alliance in Washington from Norfolk, Virginia, on September 11. Veronica Gallardo and Robert Kelly place a plastic tarp over an American flag inside the Casemate Museum at Fort Monroe in Hampton, Virginia, on September 11. A man eyes a store's bare bread shelves as people stock up on food in Myrtle Beach on September 11. Chuck Ledford, left, watches cartoons on a phone with his daughter Misty as they seek shelter at Emma B. Trask Middle School in Wilmington, North Carolina, on Tuesday, September 11. Scott Fleenor, bottom, and Jeremiah Trendell board over the windows of a business in Myrtle Beach. 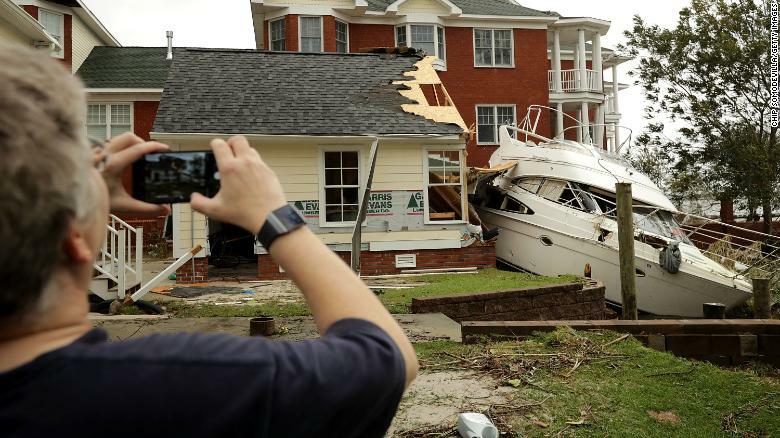 A neighbor takes photos of a boat smashed against a car garage near the Neuse River in New Bern on September 15. A truck is submerged in floodwaters in Jacksonville, North Carolina on Saturday, September 15. 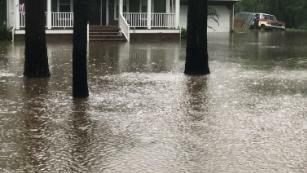 A woman calls for help at her flooded residence as Florence brought large amounts of rain and floodwaters to Lumberton, North Carolina, on Saturday. People wait in line to fill up their gas cans at a gas station that was damaged when Florence hit Wilmington, North Carolina, on Saturday. A baseball field on Mill Creek Road is filled with floodwater after Florence hit Newport, North Carolina, on Saturday. Mike Pollack searches for a drain in the yard of his flooded waterfront home in Wilmington, North Carolina, on Saturday. Floodwaters from Florence inundate the town of Engelhard, North Carolina, on Saturday. Ray Baca, from Wilmington, North Carolina, checks his phone as he sits on a bench. A sailboat lifted by storm surge leans against a building at Bridgepointe Marina in New Bern, North Carolina, on Saturday, a day after Florence's landfall. 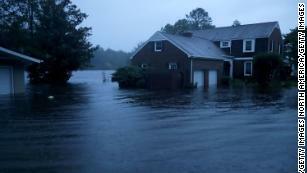 Kim Adams wades through floodwaters surrounding her home in Southport, North Carolina, on September 15. Volunteers help rescue three children from a flooded home in James City, North Carolina, on Friday, September 14. Russ Lewis covers his eyes from wind and sand in Myrtle Beach, South Carolina, on September 14. Volunteers help rescue people from their flooded homes in New Bern on September 14. Waves crash into the Second Avenue Pier in Myrtle Beach on September 14. The storm leaves a tree toppled in New Bern on September 14. Soldiers from the North Carolina National Guard reinforce a low-lying area with sandbags in Lumberton, North Carolina, on September 14. Robert Simmons Jr. and his kitten are rescued from floodwaters in New Bern on September 14. Teddie Davis checks on one of the New Bern's signature bear statues toppled by the storm on September 14. Another one of the bears, in the background, ended up in the middle of a downtown street. Rising waters threaten downtown Washington, North Carolina, as the Pamlico River overruns its banks on September 14. An abandoned van sits on a flooded road near New Bern on September 14. A boat sits wedged in trees in Oriental, North Carolina, near New Bern, on September 14. Florence has left at least 13 people dead, including a mother and her child who died after a tree fell on their house in Wilmington, North Carolina, police said. Two men were also killed in Lenoir County, North Carolina. One was killed while checking on his dogs outside while another one was electrocuted while trying to connect two extension cords, emergency officials said. 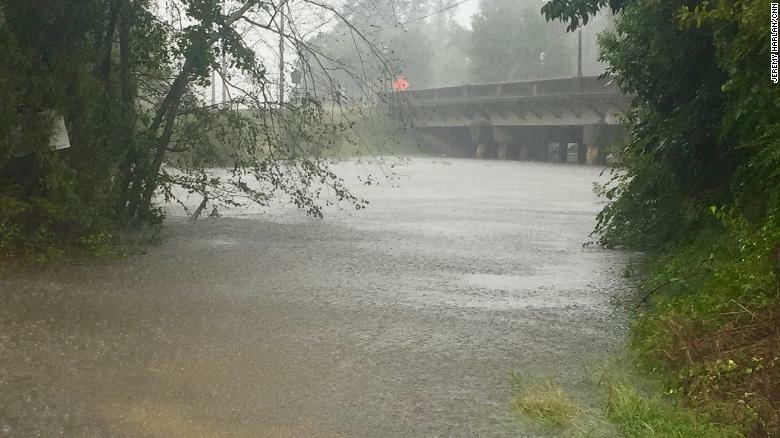 Flash flooding killed three people in Duplin County, North Carolina, the sheriff's office there said. Also, officials in Cumberland County determined that a fire that killed two people was storm-related. In South Carolina's Union County, a 61-year-old woman was killed when the car she was driving struck a downed tree, state emergency management spokesman Antonio Diggs said. A man and woman died in Horry County due to carbon monoxide poisoning, according to South Carolina officials. Catastrophic flash floods and prolonged significant river flooding are likely over for portions of the Carolinas into west-central Virginia and far eastern West Virginia as Florence moves slowly inland, the hurricane center said. "In addition to the flash flood and flooding threat, landslides are also possible in the higher terrain of the southern and central Appalachians across western North Carolina into southwest Virginia," it said. In Lumberton, residents warily looked at the rapidly rising river in the North Carolina city, which was submerged for days after 2016's Hurricane Matthew. Lumber River was rising faster than officials expected. It went up 5 feet overnight and was at 17.6 feet, more than 4 feet above flood stage, by Saturday night. It was expected to reach 24 feet by midday Sunday. Corey Walters, the city's deputy director of public works, said this was a worst-case storm scenario. 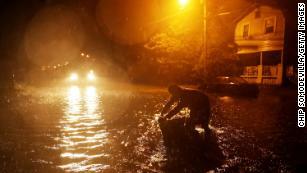 There is flooding "everywhere in the city," he said. " There have been "hundreds of rescues." Volunteers and city workers have been filling sandbags, trying to plug a low point in the city's levee system before the Lumber River crests. The Lumber River was several feet higher Saturday afternoon than when a CNN crew first observed it that morning. Water rises Saturday in Conway, South Carolina, near the Waccamaw River. Part of downtown Wilmington, North Carolina, is inundated by water from the swollen Cape Fear River. According to the National Hurricane Center, the storm will travel through upstate South Carolina, then turn north toward the Ohio Valley.